« Profound Changes in Power Generation. Resilience, Transmission Lines and Conductors. Photo by Egor Kamelev from Pexels. Transmission lines sag. The magnitude of the sag depends on several factors like the distance between the towers or poles, the weight of the conductor and temperature, both the ambient temperature and the heat of the line, which is the function of the load on the line. Sags should not be a problem, since there are defined formulas to calculate the sags as well as rules on required clearance to ground or vegetation. Nevertheless, losing transmission lines due to short circuits caused by tree-to-(power) line contact can be a major reason why blackouts cascade. If the system is already stressed, losing a line results in overloads on remaining lines. The overloaded lines heat up and sag more, maybe beyond emergency ratings or tree trimming has not been kept up, increasing the risk for tree-to-line contact and more lines will be lost. It happens fast, like a cascade, as was the case in the 1996 Western North America blackout, the 2003 Northeast blackout, the 2003 Italy blackout, and many other blackouts. 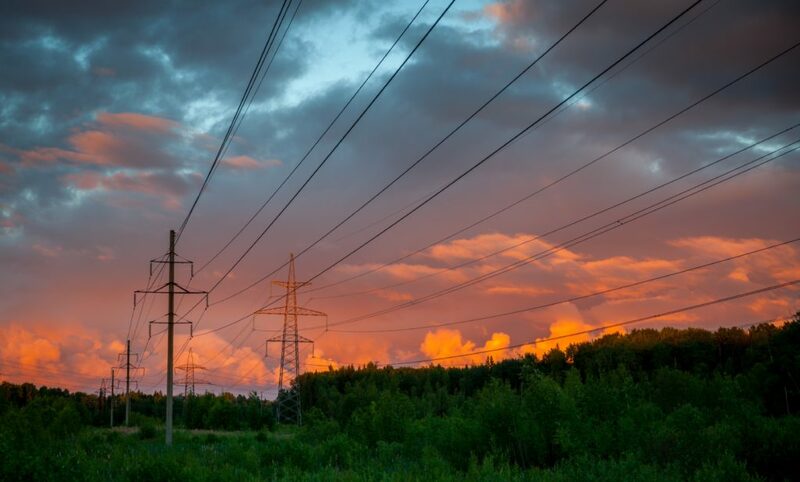 Large blackouts are rare, but tree-to-line contact is one of the most common reason for power outages, which can range from short duration to catastrophic events with loss of life and damages in the billions of dollars. For example, the 2017 California wildfires cost the life of 2 firefighters and 45 civilians. Over 9000 structures were destroyed. The cost of the fires has been estimated to exceed $15 B. While it may be impossible to eliminate all risks for tree-to-line contacts, unless “under-grounding” the system, there are many ways to mitigate the risks for it to happen. Improved tree inspection and trimming is a given. Other ways are installing cameras, weather stations, current limiting fuses, and falling conductor detection devices. All intended to capture real-time data and to respond faster. Hardening the system, by fire resistant poles and insulated conductors, certainly help, but is up-front expensive. A better solution may be to use high-performance conductors, which do not sag as much as the mainstream conductor, ACSR (aluminum-conductor-steel-reinforced). The ACSR conductor, introduced in 1907, is since the 1920s by far the most commonly used conductor for transmission lines. It has a steel core to carry the aluminum strands, which conducts the current, and thus the electric power. ACSR conductor and ACCC conductor. Replacing the steel core of the conductor with a carbon fiber composite core makes a big difference. The most used high-performance conductor, the ACCC® (aluminum-conductor-composite-core) conductor, has a hybrid carbon fiber core and trapezoidal profile for the aluminum strands, allowing almost 28 % more aluminum without any diameter or weight penalty. It basically doubles the “ampacity”, the power transfer capability, while at the same time reducing the line losses by 25-40 %. The thermal expansion is about 1/10 compared to an ACSR conductor. The lower thermal expansion is a big deal, when it comes to sags, but even more important is the radically different characteristic in terms of sags as a function of temperature. For the ACSR conductor the sag is proportional to the temperature of the conductor. For the ACCC® conductor the sag is proportional to the temperature but only up to a “knee point temperature”. Above that point the sag basically remains constant! It substantially reduces the risk for tree-to-line contacts at overloads. Sags as a Function of Temperature. 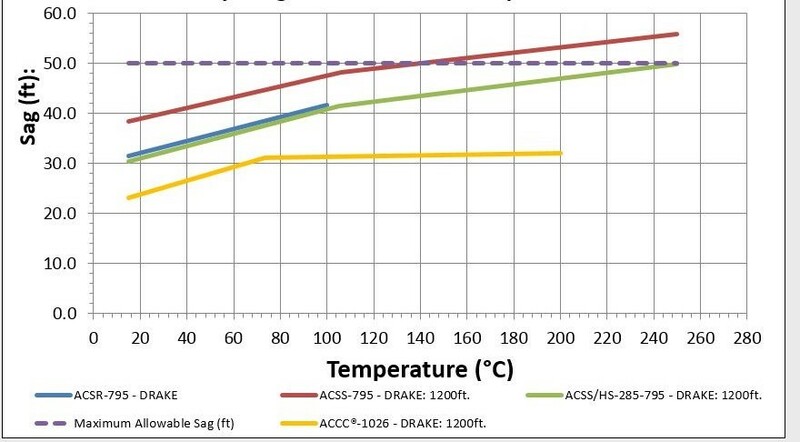 Comparison between ACSR, ACSS (aluminum conductor steel supported) and ACCC conductors for a 345 kV transmission line application. Day 1 numbers. Source: CTC Global, Inc. Resilience can also be helped by the stronger high-performance conductors. Thanks to strength of the carbon fiber composite core, the ACCC conductor can take more physical stress from mechanical forces as well as wind. It was illustrated in 2013, when an oil tank, picked up by the intense winds of an EF-5 tornado, hit into a steel monopole of a 138 kV transmission line in Oklahoma. The pole was bent to a 45 degrees angle. The mechanical shock snapped the aluminum strands of the conductor, but the composite core prevented the monopole from hitting the ground and enabled a fast repair. 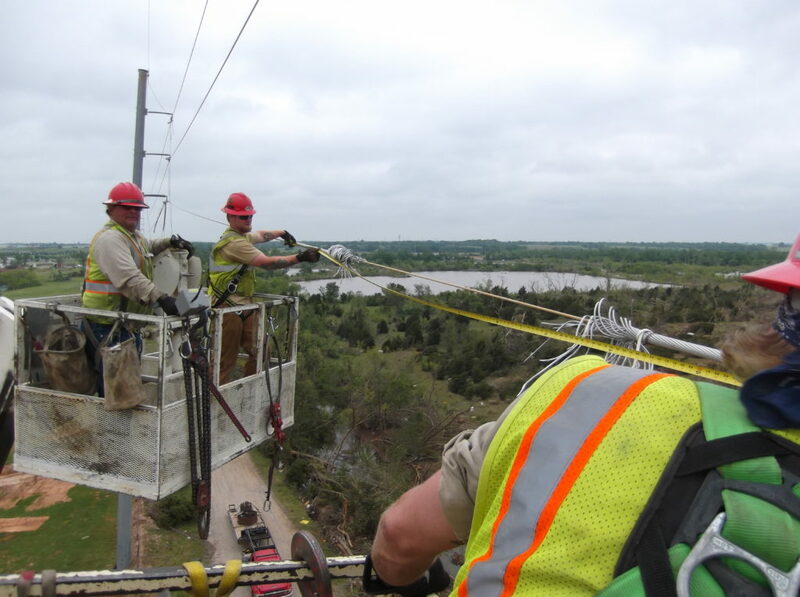 Linemen from Oklahoma Gas & Electric repairing an ACCC conductor. Thanks to the composite core being intact the conductor could be spliced on site, enabling a fast restoration of the line. Probably, the biggest benefit of a high-performance conductor is the much higher “ampacity”. The ability to move about twice the amount of power when reconductoring a transmission line utilizing existing towers or poles adds to the resilience of the whole system. In November 2015 AEP (American Electric Power) completed the reconductoring of two 345 kV transmission lines, using ACCC conductor, in Lower Rio Grande Valley, Texas. The reconductoring, in total 240 miles of conductor, was done utilizing existing towers and right-of-way, while in energized state! For this project AEP received the 2016 EEI (Edison Electric Institute) Edison Award. The transmission system is the backbone of the electric system. It is designed to be redundant. The reliability is set high with the N-1-1 criteria requirement by NERC (North American Electric Reliability Corporation). N-1 is to have the system “survive” the loss of a major generation unit or a major transmission line. N-1-1 is the ability to withstand a consecutive loss. Expanding the toolbox of solutions to make the system even more robust and resilient, using ACCC or other high-performance conductors, will go a long way. The Future of Electric Transmission. Annual Sales of EVs Just Short of 2 Million. The Future of Power Generation. Profound Changes in Power Generation. www.Orkas.com Copyright © 2013. All Rights Reserved.